Many Palmyra High School athletes play multiple sports and are involved in multiple clubs while still succeeding in the classroom. Palmyra High School’s Gio Nahrwold battles an Audubon High School player during a game between the two schools on Oct. 26. Nahrwold is a three-sport athlete who is also involved in student council, Interact Club and Spanish NHS. A spectator who attends Palmyra High School athletic events throughout the year will notice some of the same athletes playing in the fall, winter and spring. Multi-sport athletes are a necessity for Palmyra, as the high school has one of the lowest enrollments figures for a public school in South Jersey. Niche.com lists Palmyra’s enrollment at just 421 students, the lowest for a public high school in Burlington County. According to the NJSIAA’s 2017–18 classifications, the only South Jersey school with a lower enrollment figure than Palmyra is Wildwood High School. Being an involved student-athlete at Palmyra is not for the faint of heart, but the rewards on and off the field can be great. Palmyra’s fall sports teams have had lots of success in recent years. 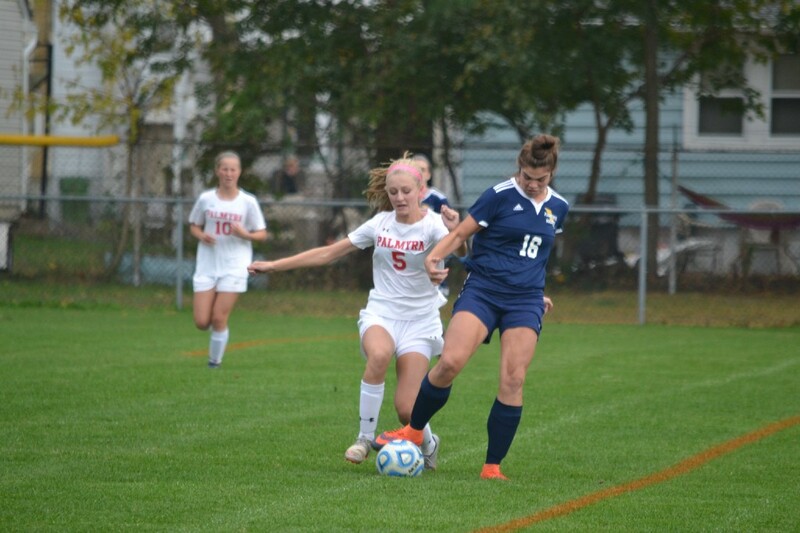 The boys and girls soccer teams have each lost only two games this season and could be contenders for sectional championships. The girls tennis team finished the season with a 14–7 record. The football team was just 2–4 entering its Oct. 28 game against Bordentown Regional High School, but is only two years removed from a 10-win season and an appearance in the Central Jersey Group I championship game in 2015. Additionally, many student-athletes are leaders in the classroom and in the hallways. Numerous athletes are members of student council and work on community service projects through the school’s Interact Club. Some are also National Honor Society members and post high marks in honors and advanced placement classes. Excelling in academic, athletics and extracurricular activities doesn’t come easy. Student-athletes must balance their time and take their commitments to their schoolwork, teams and clubs seriously. Coaches, teachers and advisors also play a key role, communicating with each other to make sure students can participate in activities while staying committed to their academics. Being a busy and successful Palmyra High School student-athlete is a total team effort. Scotty Smyth is a three-sport athlete at Palmyra, playing soccer, wrestling and tennis. Because of Palmyra High School’s small size, multi-sport athletes are a necessity for the athletics department. Nahrwold said coaches will frequently meet with groups of students who aren’t committed to a sport in a certain season to encourage them to try out for their team. Matt Papenberg, head coach for Palmyra’s girls soccer team, said the coaches encourage athletes to try out for different teams and broaden their horizons. Smyth is one player who relishes being a three-sport athlete. He said there are a ton of benefits for competing in multiple sports. Smyth also cited a study released from the American Academy of Orthopedic Surgeons earlier this year that showed high school athletes who specialize in one sport are statistically more prone to musculoskeletal injuries. The study also revealed 45.2 percent of high school athletes specialized in a single sport during childhood. Playing multiple sports also gives students an opportunity to make new friends and associate with different groups of people within school. Other athletes play multiple sports because of their love of Palmyra and their pride for the small school community. Junior Julia Adams has so much Palmyra pride, she chooses to represent her school in swimming meets during the winter season. Adams competes as an individual swimmer in various high school county and sectional meets as Palmyra High School does not have a swim team. Adams also plays soccer in the fall and is on the spring track and field team. For many athletes, Palmyra pride goes beyond just the athletic field. Numerous athletes are also leaders in other ways. Angelica Johnson had a strong senior season for Palmyra girls tennis in 2017. Johnson played third singles for the Panthers, losing just one match during regular season play in 2017. She managed to perform well despite balancing tennis with classes, marching band, the Interact Club and more. Johnson’s day typically starts a little after 7 a.m., when she wakes up. She sleeps as late as she can while still getting to school in time for homeroom at 7:50 a.m.
From the beginning of September through the end of the tennis season last week, Johnson would either go to practice for girls tennis, get dressed in her uniform and prepare for a home match, or board a bus for an away match. Once tennis is over, Johnson and some of her other teammates immediately go to marching band practice, where she plays the baritone horn. Practices are held on Monday and Wednesday nights from 6 to 9 p.m. The marching band performs on most Fridays and Saturdays in the fall at either the football team’s games or in weekend band competitions. The tennis players and other athletes try their best to get to band practice on time, but may arrive late if they’re playing an away tennis match. It isn’t until 9:30 p.m. where Johnson can finally take a break and relax before the next part of her evening starts. After finishing her homework, Johnson is finally able to get to bed around 2 a.m. and get a few hours of sleep before repeating her hectic schedule again the next day. Many student-athletes share Johnson’s busy schedule. 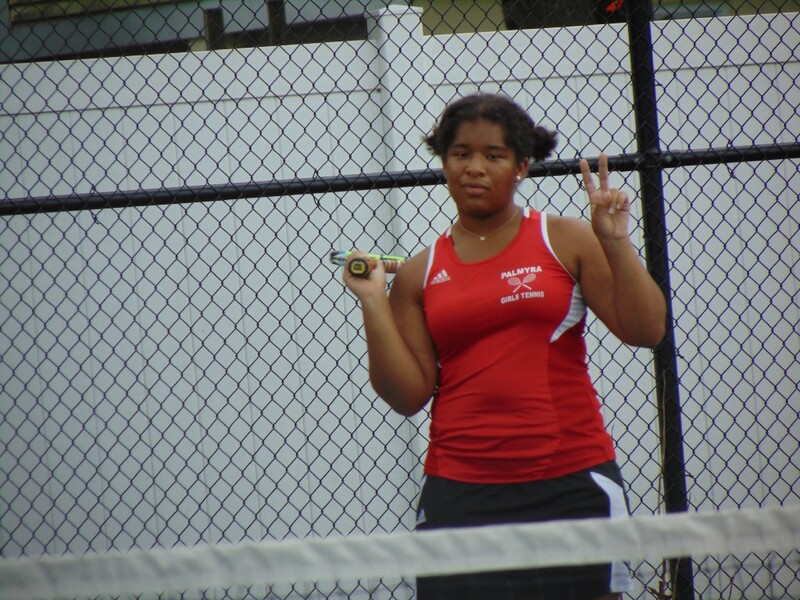 Shyla Bell plays tennis and is in the marching band like Johnson. She chooses to wake up and go to sleep earlier, but her routine of class, tennis, band, homework, sleep is otherwise the same. 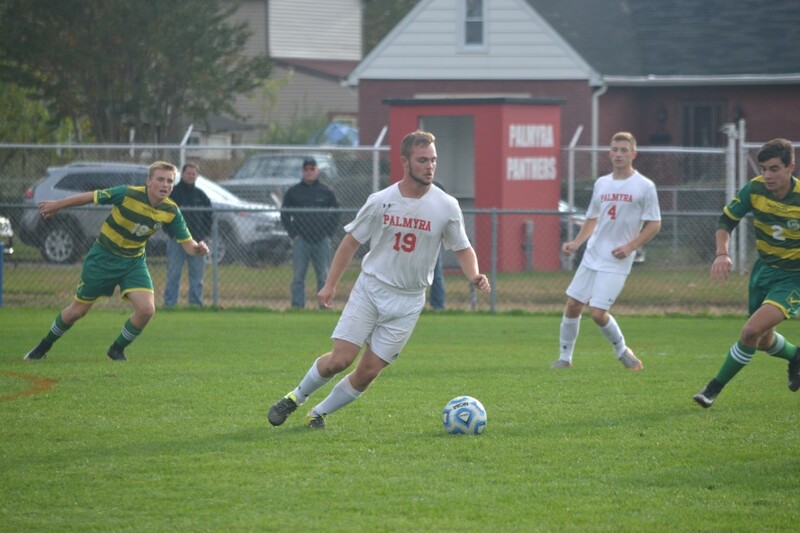 Athletes on Palmyra’s soccer teams share similarly hectic schedules. Senior Scotty Smyth, a three-sport athlete in soccer, wrestling and tennis, said his schedule last spring was the busiest he ever experienced. “I’d go straight to tennis once school was done, and then I’d either have to go to wrestling practice, which is 40 minutes away in Delaware since I wrestle club, or I’d have to go to club soccer,” Smyth added. Competing in multiple sports is something Smyth and numerous other Palmyra athletes do. Being a multi-sport athlete carries a lot of responsibility, but there are a lot of benefits that come along with it. 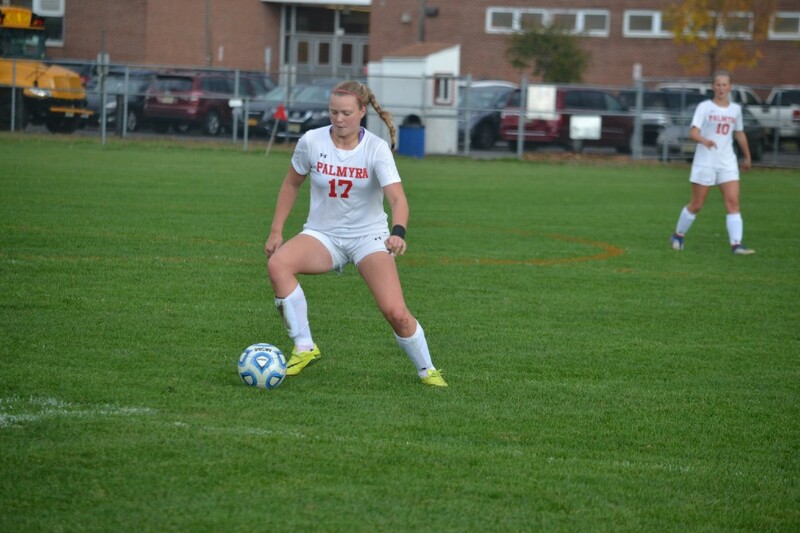 Palmyra High School’s Lily Beck plays soccer and is a cheerleader during the fall. A number of players on the Palmyra girls tennis team spend just as much time together on the football field as they do on the tennis court. Many members of the team also perform in the school’s marching band and are sometimes required to go right from tennis to marching band when both groups are in season during September and October. Junior Daphne Philippoussis is one of the players who is on both the tennis team and the marching band. Despite the busy schedule, Philippoussis believes doing both activities is very rewarding. Ashlynn Johnson, another member of the tennis team and marching band, said doing both activities can be tiring, but it also serves as a bonding opportunity for the girls. The girls who play tennis and perform in band like to say they play two sports in one season because of the amount of movement involved with the marching band. Junior Lily Beck could also say the same. Beck not only competes on Palmyra’s girls soccer team, she is also a part of the school’s cheerleading squad, which practices during the week from 5 to 7 p.m.
“After soccer practice, I rush back over to the school for cheer,” Beck said. Soccer and cheerleading are just two of the many activities Beck is involved in. Beck is in the German National Honor Society, German Club and Interact Club and is applying for the National Honor Society. Beck also plans to be the boys basketball team’s manager this upcoming winter. She plans to do this even though she is a three-season athlete herself, competing on the track and field team in the winter and spring. “I went through my schedule to make sure I could do it,” Beck said with a laugh. Other athletes share Beck’s long extracurricular resume. Her soccer teammate, Adams, is the vice president of student council, and a member of the Interact Club, Book Club, Drama Club, Spanish National Honor Society and serves as the wrestling team’s manager. Smyth is also on student council and is a U.S Naval Sea Cadet outside of school. Nahrwold is involved in student council, Interact Club and Spanish NHS. Last Tuesday, he could be seen hurrying out of boys soccer practice at Legion Field to help some of his peers prepare homecoming decorations at a student council meeting. Many times, athletes are able to attend club meetings prior to practices and games. The students wouldn’t be able to do this without a helping hand from their teachers, coaches and advisors. At Palmyra, the teachers, coaches and advisors work together to give students the fullest experience possible. 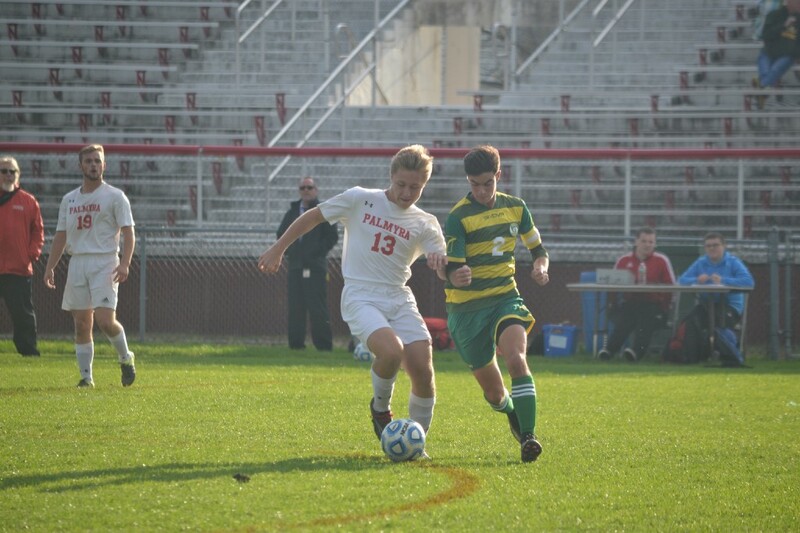 Papenberg, who is the Palmyra athletic director in addition to being the boys soccer head coach, said many teams and clubs will schedule practices, meetings and other events at strategic times so students who do multiple activities will have as few conflicts as possible. Girls tennis head coach Katie Salvo echoed Papenberg’s statements. She talked of how her team’s practices are slated to end so the players who perform in the marching band can get there on time. Adams said the school’s Interact Club holds multiple meetings to accommodate many of the athletes. “Interact has both a morning and afternoon meeting for the athletes that have practice or games right after school,” she said. Coaches also want to make sure their athletes are focused on their schoolwork above everything else. Papenberg said a number of his players are NHS members or take honors and AP classes. He wants them to make sure they maintain their high grades so they can get into their first college choice. The student-athletes recognize the importance of schoolwork. Many of them have as much as four hours of homework per night. To get all of their work done within their busy schedule, the students have to get creative. Homework is done in between practices, during lunch and sometimes even during lulls at certain club meetings and activities. Many of the students also stay up late to get their homework done. Angelica Johnson said she is sometimes up as late as 2 a.m. Smyth also said he is usually up to midnight studying before he goes to bed. Other athletes have similar routines. The life of a Palmyra Panther can sometimes be hectic, stressful and exhausting. However, many of the athletes say the positives outweigh the negatives and couldn’t imagine their high school experience any other way.